To get the most from the latest technological advancements, you have to incorporate key products into your working environment. Good office design puts what you need in a place where you can access it easily. You want your telephone, tablets, music players and other electronic data devices nearby. The Axil-Z is a power and data center that takes advantage of a newly engineered and patented solution to mount flush with the top of your desk. If all you do is to save time by gathering and going with your portable devices and their cords quickly, you will reap immediate benefits, but the Axil-Z allows you to do much more. Keeping all of your technological devices powered is essential if you want them to be ready to work when you need them. The Axil-Z allows you to provide power without adding clutter by mounting the power source flush with the surface of your desk. What makes this unit different from other power outlets is its patented spill-resistant design. 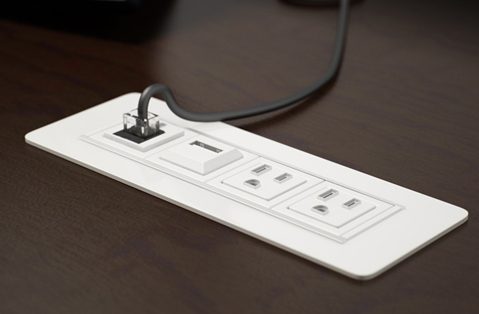 This groundbreaking design frees you from the worry of a disastrous end for the power center or your devices from the occasional splash from your cup of coffee. Technology that you do not use is a drain on your bottom line. You will more likely use your technology when your office design includes a space to display and power your devices in an attractive and functional manner. Choosing the Axil-Z gives you the option to configure it to match your data power needs. You can have power, data, USB, VGA or HDMI ports at your fingertips. Since everything is right on the surface, you no longer need to reach under your desk or behind filing cabinets to plug in or unplug your devices; making each much more convenient to use. You should never sacrifice safety when putting together your office space. The Axil-Z is UL listed so you can be sure that it meets the relevant safety standards. In addition to being a practical solution for your office power and data demands, the Axil-Z is a stylish option. Good office design relies on taking every opportunity to combine form with function; as you can with a stylish, flush mount power and data center.